The file in question is the data\descr_effect_impacts.txt - you're looking for the fade_time under arrow, javelin and soliferrum impacts. Alternatively, wait another hour or two for 2.02b and I've included an amended one. Thanks for all your work as per usual, Quintus. I would like to see the re-emergence of destructible wonders(excluding permanent structures/trade routes like the mountain in Getia Koile and amber route) in the future, if it is at all possible. I loved sacking Delphi and Rome as the Arverni, and how the oracle of delphi for the Celts gave -20% public order until you destroyed it. It really gave an incentive for attacking certain cities, because of the sheer riches you could acquire(which was true for certain cities and certain sackings of said cities). I would also like to see the reappearance of the "Frightens nearby enemy infantry" trait tacked onto the Gaesatae. Currently, playing as any celtic faction which possesses them, I find no real reason to use the Gaesatae. Other more heavily armored and more durable infantry units already have the "Inspires nearby troops" trait, and generally do everything(except throwing javelins) better than the gaesatae, and given their lack of armor they generally tend to just get destroyed. While I do understand that some of their vulnerability probably comes from people's difficulty with them in the past (I remember seeing one thread on the org I believe titled "How do I kill Gaesatae? "), as someone who loved using them in EB1 it's sad to see how ineffective they seem/have possibly become. A troop count of 50 also solidifies the weakness and their obsolete nature. It's also saddening to see the Hellenistic royal guard and Sauromatae heavy cavalry units have the "frighten nearby enemy infantry" trait, but none of the celtic units possess this trait. If any Celtic unit should possess this trait, it should probably be the fearsome gaesatae, or at least I think so. I do believe that at this time the naked warrior traditions were somewhat dying out(I think I remember reading that in either an EB in game description, or in one of your forums--so don't quote me on that), and that the gaesatae were too OP in EB1, but as of now, I see no reason to use them as opposed to a unit of Argoi, who are much more durable than they are. Maybe I'm using them wrong, but my experiences with them have been largely non-positive, and not at all what I expected, their casualty rates made them unfeasible(to me) for anything other than as hired mercenaries for when you wish to quickly fill your ranks; a sad far cry from the vanguard worthy force that they were in EB1. I respect the idea that casualties for naked warriors should likely be high, but the psychological effect that they bring to the field is still incomplete in my mind without frightening nearby enemy infantry, and perhaps a higher charge value(similar to the 12 they had in EB1), although I'll still let you all be the judges for numerical stat balancing. Overall, I found them to be wanting, which made me sad, because several of my world conquering armies had gaesatae in them in EB1. As always, keep up the good work guys! Have you guys done the Indian settlements yet or do you have any plans yet to do them? 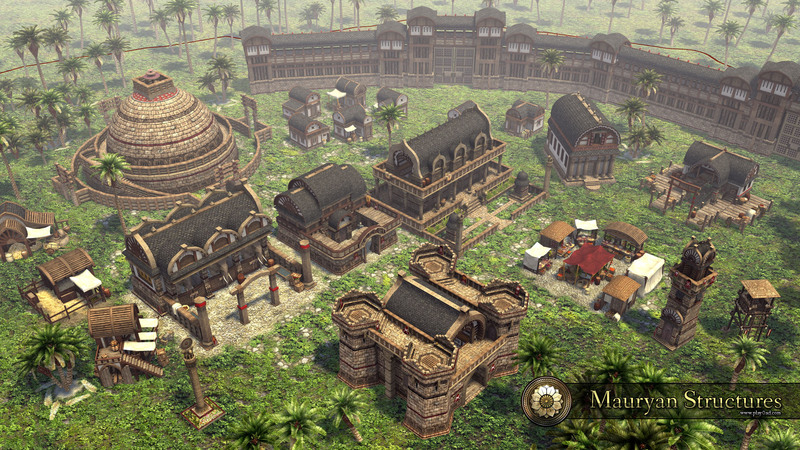 Came to mind when I saw 0 AD's depiction of the Mauryan culture, and wondered if there were plans to make custom settlements like that for the cities of the Indus. I've quietly slipped this into 2.02c, when I was fixing the units with "frighten_horse" (doesn't exist - it should be "frighten_mounted"). So from now on they'll have it. I have a small suggestion regarding units. For a new player or in case of a new campaign with a previously unplayed faction, it's rather confusing to know which units receive a free upkeep in towns. Perhaps those units could have this mentioned with a simple line in unit card description? Anyway, thanks for the great mod and keep up the good work! It's not a bad idea, but unfortunately the whole business of free upkeep is a bit of a mess at the moment. Until it's resolved, I don't think highlighting the units with free upkeep would actually be useful. Will secondary weapons for pikemen be making a comeback any time in the future or has it been confirmed that they will only have their sarissa? Unless someone has a breakthrough that causes the M2TW engine to handle them as well as the RTW engine did, no, they won't be making a comeback. We've tried all sorts of variations, pikes (and spears) aren't compatible with secondary weapons. You might note that elite spearmen like Hypaspistai and Carthaginian Sacred Band no longer have secondary weapons either - because again they're basically swordsmen who occasionally use a spear. De Bello Mundi has the white flag script- if you are besieging a settlement and have more man power then defenders, you can ask them to surrender. Can this be done in EB? You're almost always going to have a larger army than the defenders, that's kind of the point of fortifications as a force multiplier. But this is interesting, nontheless, since it might reduce the scale of Siege: Total War. What happens to the garrison who were defending the place, if the AI accepts? ... well as I remember the defenders were exiled from the settlement, all units. I can't remember that this was happening automatic or was there some other options. True. But the conquerors did not always get city by force. Last edited by Demon Soul; May 25, 2015 at 12:41 PM. This would be interesting, both for gameplay and RP purposes. Maybe it can be implemented with a force ratio-percentage for success. Anything less than 40-50% and the AI won't accept to give up the city. More than that and the chances increase exponentially. Could this be done? So this is implying an "honourable surrender", whereby the garrison marches out with arms and banners and all the regalia of war. Rather than a treacherous surrender, where some elites in the city open the gates for the besiegers, who massacre the garrison. Indeed, more often than not they did it by treachery (a mule laden with gold for the governor would do it). Agreed, it definitely warrants some investigation. I'd like it even more if there was a bribery option, too. Where do the units go once they're in "exile"? Could it possibly be to another eleutheroi territory to strengthen that area? I've just check the script in DBM (you have to got 2:1). First approach- one full stack besieging rebel city aaand they refuse to surrender. Second approach, now besieging another rebel city and this time it was success. After the defenders leave the city, you have to keep small garrison in occupy city for one season before you can enter the city with full forces. They were rebels already and the exiled forces stay in lost province, but I think the one nation army does not transform into rebel. This topic rocks! Great insight from a lot of people. I play mostly "Eastern" campains and I have some suggestions for them (since most of you guys seem to "love" the Celts or Greeks). -Recruitment for Pontos and Armenia is terrible. In the case of Pontos the starting Gov type "Stratigeiai" allows only two units, both extremely toned down. Armenia severely lacks in this department as well. No access to Hellenistic units unless you conquer a city with Hellenistic Polis. IMO allowing Pantodapoi Phallangites with the starting Gov for both of them should solve this. It would also be great to see an Eastern Kingdom using an Eastern Phallanx variation against the Hellenes. -In areas with strong local military tradition, like Galatia or Sparta for example, no local units are available to the Easterners. The Foreign conscription building should provide more options. Could you please at least tell me if it's under consideration? Thanks in advance.